Winkie’s blog at Afloat.ie is essential Saturday breakfast reading. Recently he treated us to this fascinating examination into the first recorded circumnavigation of Ireland by a yacht. And, Winkie being Winkie, he strays beautifully off topic now and again. The biggest question though continues to offer great argument: does one leave Ireland to starboard, or to port? Which begs the further question… would it stir up renewed public interest in the biannual Round Ireland Yacht Race to offer competitors the choice? Many of Glasgow, Scotland yacht designer G.L. Watson’s earliest clients for state of the art and ground-breaking racing yacht designs were from Ireland, reflecting the strength of aquatic and often genealogical links across the Sea of Moyle/ North Channel. Martin Black’s biography, G.L. 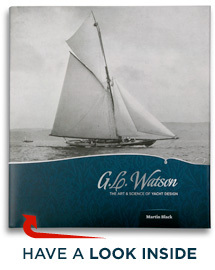 Watson – The Art and Science of Yacht Design, recalls some fiercely competitive “cross-channel” matches – especially in the c.30ft (9.14m) long 5-Tonners of the 1870s – between Irish and Scottish owners, with the Irish often the ones to take a risk on the young, relatively unknown Watson against Scottish-owned William Fife (Senior and Junior) designs. This entry was posted in America's Cup, book, Dublin Bay - The Cradle of Yacht Racing, humour, Irish yachting, journalists, other yacht designers, yacht clubs, yacht design, yacht racing, yachting history and tagged 5-Tonners, Afloat magazine, circumnavigation, Dromineer Literary Festival, round Ireland, Round Ireland Yacht Race, W.M. Nixon, William Fife II, William Fife III, William Fife Jr, William Fife Sr, Winkie Nixon. Bookmark the permalink. 1 Response to Ireland to starboard, or port? I don’t collect books on cruising. However, following the write-up by Winkie I bought “The Log of the Olivia” from Amazon. It is a delightful reproduction of a yacht’s log covering voyages around Ireland, the UK, cruises on the West Coast of Scotland and a voyage to Norway between 1859 and 1867. The writer of the log was William A Power, a Dublin based yachtsman. It is illustrated with really nice pen and wash drawings and at £3.49 is an absolute steal. I promise you that you won’t be disappointed.